PSX Frogger: He's Back! (USA) "100%" in 47:55.88 by CaneofPacci. Frogger: He's Back! is a late '90s remake of the original arcade classic Frogger. 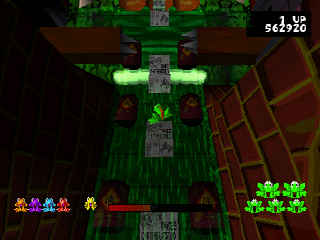 The game sports an updated set of graphics rendered in 3D and several new moves. Frogger must hop left, right, down and up through jungles, busy streets, sewers, and even the clouds to save his five little buddies as well as the golden frogs of myth. CaneofPacci manages to beat the game in just under 48 minutes while still saving all of the frogs on each level. Note: Due to an emulator bug, the game music does not dump properly from PSXjin.